I got a rather interesting email today, so I thought I would share it with you; my lovely readers. I don't know if any of you saw the Channel 4 series "Baking mad with Eric Lanlard"? I caught a couple of episodes and it was pretty good. Some parts were a little corny but I picked up a few great tips on cake baking and decorating. Are you passionate about baking? Have you got some impressive dessert recipes up your sleeve that could wow even a master baker? Baking Mad are looking for passionate bakers to compete in a mini bake-off (fun!) 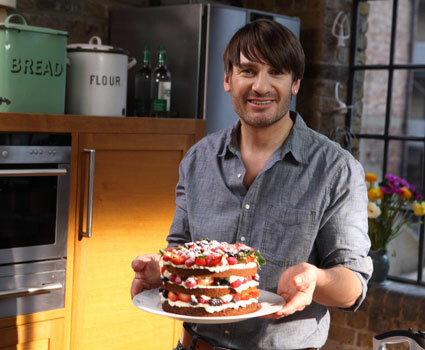 for the chance to have a one on one lesson with master patissier and baker to the stars Eric Lanlard! If you have never heard of Eric (gasp! ), he is twice winner of the prestigious Continental Patissier of the Year at the British Baking Awards, Eric has earned himself an international reputation for show stopping cakes. Through his designer cake emporium Cake Boy, Eric attracts an impressive A-list clientele and a global fan base. Do you think you’ve got what it takes to impress Eric with your culinary skills? Then please drop us an email at bakingmad@infinite-media.tv where you will be prompted to fill in one of our application forms telling us why you would like to take part. We will be filming throughout December and January. Successful applicants will be needed for one filming day only. Doesn't that sound fun? I am a bit scared to apply myself as I am not sure my skills could wow a regular baker, let alone a master baker. Do you have what it takes? What signature dessert would you wow with? UPDATE: application had been sent, thank you for your lovely comments on here and twitter... I will keep you posted. You should do it you have what it takes. I think you should definitely enter - all of the stuff you post on here looks delicious, and I think you could get through, and even if you didn't it would still be an amazing oppurtunity; can you imagine if you didn't apply and regreted it FOR THE REST OF YOUR LIFE? Ok, maybe that's a bit over the top, but I still think you should go for it! Your battenburg the other day got my tummy rumbling just looking at the picture! How do you know unless you try? You miss 100% of the shots you don't take. There are so many opportunities I didn't take advantage of because I was scared or didn't think I stood a chance. And I regret every single one of them. Do it! You're obviously capable otherwise they wouldn't have e-mailed you. Exciting times! He's a bit of a hottie so if you need anyone to carry your wooden spoon I'm your gal! Go for it - what a great opportunity! You will enjoy it so much and are definately good enough going by your blog pics! The competition prize looks brilliant! I've emailed them for an application form as well..although I'm very anxious to do something like this, it would be a challenge! All the fun of the festival! A bit of a scone fail. Craft North East: How I went cupcake crazy! All graphics, design and content were created by Nelly for Nelly's Cupcakes. Powered by Blogger. © Nelly's Cupcakes | All rights reserved.